Helicopters, tanks and other vehicles could someday be made of "smart material" that senses damage, similar to how nerves tell the body it has been injured, with the help of new research based at Clemson University and funded by the U.S. Army Research Laboratory. The idea is that magnetically sensitive material would be embedded within the smart material throughout the vehicle and act as a sensor that says, "Ouch! We have damage here," said Oliver Myers, an associate professor of mechanical engineering. "In the field, we need that self-diagnostic capability," Myers said. "Lieutenant Data in 'Star Trek' always says, 'I'm performing to specified parameters.' We want to make sure our platforms are performing to those specified parameters at a minimum." The research could help the Army save money on rotorcraft maintenance, said Asha Hall, the lead co-principal investigator and Prognostics and Diagnostics Acting Team Lead within the Mechanics Division of the Vehicle Technology Directorate at the U.S. Army Research Laboratory. "We're trying to extend that maintenance-free operating period," she said. "The big, big impact is to reduce sustainment costs for the Army." The team is sandwiching "magnetostrictive" material between multiple layers of composite materials, creating a laminate. The magnetostrictive material responds to a magnetic field or a change in stress, allowing it to act as the nerve that senses the damage. "The composite laminate effectively becomes a smart structure," Myers said. Part of what makes the team's approach unique is that the magnetostrictive material that senses the damage is embedded in the structure itself during the fabrication process, rather than attaching sensors after the structure is already built. Those external sensors often require additional equipment, Myers said. Richard Figliola, acting chair of the Department of Mechanical Engineering, said that Myers was well qualified to lead the research. "Dr. Myers has deep experience in smart materials and smart structure mechanics of systems ranging from nano- to macro-scales sizes," Figliola said. "He has written journal articles and attended conferences to develop relationships with his collaborators. The award is well deserved." 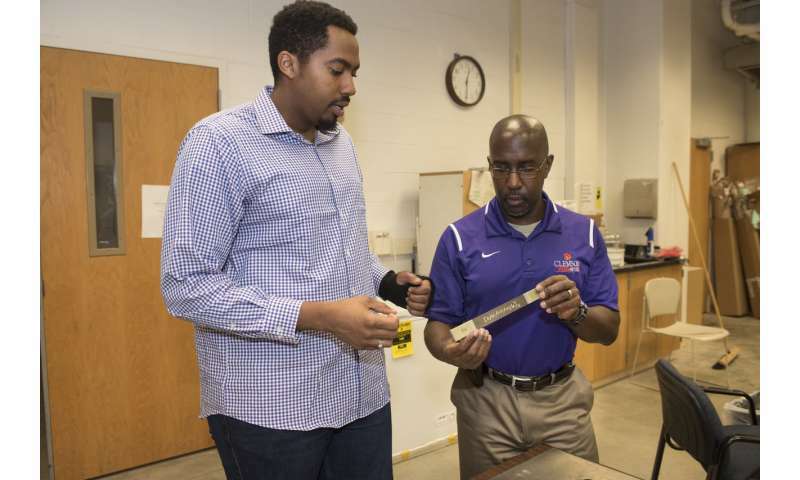 Myers said the research was inspired by his master's work in the Mechanical Engineering Department at the University of Maryland, Baltimore County, where he studied under the Meyerhoff Scholarship Program. That's when he began playing with the idea of embedding materials in composite structures to see if damage could be detected. The central question Myers is asking is how the team can create a "robust sensing operation" using the embedded magnetostrictive material. Robust would mean it is observable, repeatable, measurable and sustainable, he said. "We want this to not only be a benchtop experiment, but we want to be able to put it on larger structures and larger systems so that once we go from the benchtop coupon level we go to a full-size system and have it function as an NDE, or nondestructive evaluation, structural health-monitoring platform," he said. Anand Gramopadhye, dean of the College of Engineering, Computing and Applied Sciences, congratulated Myers on the award. "His cutting-edge, innovative research could produce discoveries that have a significant impact on operational capabilities and technologies for the Army," Gramopadhye said. "The amount of the award is a testament to his hard work, the creativity of his approach and his leadership in creating smart materials."